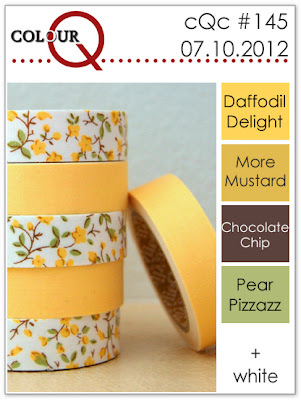 I love this floral Washi tape. I had heaps of ideas running through my head as to what I was going to do for this challenge as I am participating in the Online Card Classes Stretch Your Stamps class and am suffering from inspiration overload. This is what I ended up making, which is a total 180 from some of my original ideas, lol! I'm pleased with the way it's turned out as it's quite different from my normal style. I've used Distress Inks for all the stamping, using techniques I learnt from Tim Holt's Creative Chemistry 101 class. Well, I must be off - had a massive unplanned sleep in this morning and have wasted 1/2 the day already. Wow! This is a stunning card, Jo. Love the effect of the Distress Inks. Brilliant card Jo! love the effect and technique you have used. This is beautiful! It really stood out in the CQC gallery! 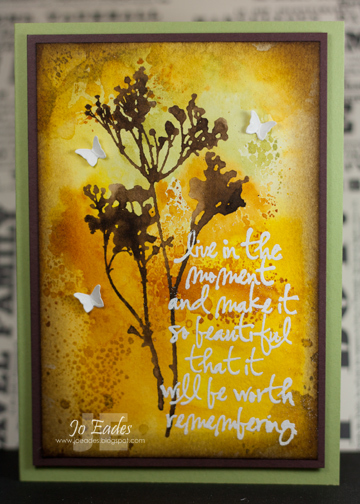 Beautiful card, Jo, love the stamping technique you used! Thanks for joining in the fun at the CQC this week and sharing your card. Two words Jo ... stunn ing. Wow! So effective! Beautiful card. This is a really different style for you but I LOVE how it turned out. Awesome job my friend.